Living in Ubud from a software engineer's perspective. My wife taking a morning walk in a rice field next to our home. It has been 8 months since I and my wife moved to Ubud, Bali. Our initial plan was to just stay a few months here, then figure out where to live in rest of our life. This was last April. Before that, we lived in Oakland (California), and little bit in Morocco and Turkey for a short period. I'm a software engineer (from Turkey), and my wife is a photographer (from Indonesia). I mainly work on my recent venture Kozmos, and sometimes work remotely to support myself financially. Anywhere with internet connection is good enough for me. But my wife Nova needs a community interested in art to succeed in her job. Ubud ended up as a good (or OK at least) for both of us. I can peacefully focus on my work, and Nova could easily found a job in her field, in additonal to freelance photography assignments. Shortly after settling down here, my wife got pregnant and we decided to live in Ubud at least next a few years. Now I have a residental permit that can be extended up to 5 years. This is our personal story though. In this article I want to share useful information about living in Ubud. What is good and what is not so good about living here. I'll share my answer in this blog post. While you read it, remember that everyone has a different taste. This photo doesn't match the text, and that's ok.
Balinese people (and most SE Asians) are happy, friendly and grateful. It's inspiring to live in a community where people's happiness don't depend on materialistic values. Even in most stressful situations (like a possible traffic accident), they stay positive and smile to eachother. There is also a western community in Ubud. I've met many people who moved from US, Europe and Australia. Ubud is more popular among people above 30 years old, and they're mostly smart & successful people who choose to live here meanwhile working towards their goals. They contribute the community by opening businesses like co-working spaces, art galleries, or organizing events like Startup Weekend, Writer's & Reader's Forum, etc. 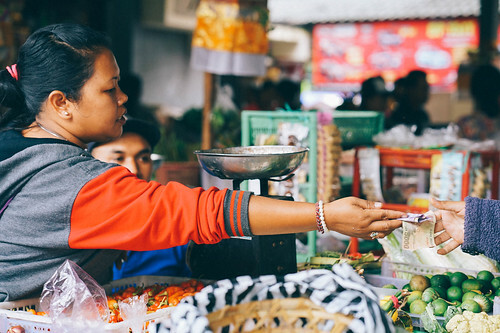 Ubud is not only a beautiful, it's also an affordable town. This helps me a lot because I can have some financial freedom to build my projects without rushing to make profit. That's how I can afford to build my latest project, Kozmos. So the total is about $500. This doesn't include eating outside sometimes (we love sushi) or grabbing coffee, co-working space membership, beer, and other expenses. Ubud has so many art galleries running exhibitions and similar events in the town. 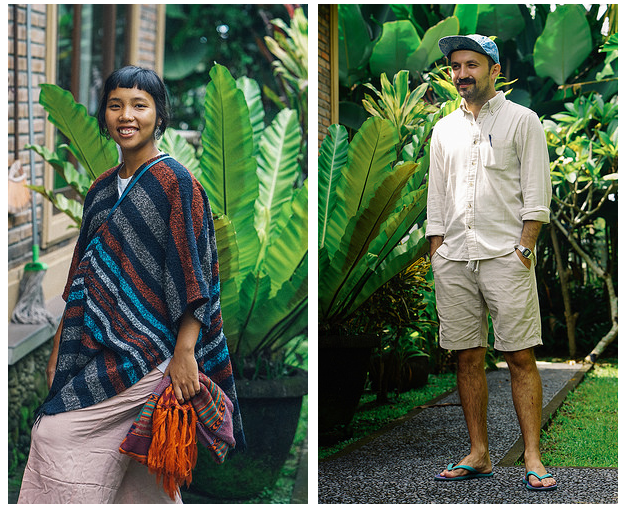 This attracts artists to live in Ubud and we get to be surrounded by interesting & cool people. I occasionally meet new people from interesting fields and learn something new about art from them. Just last week, my friend was showing me a kind of Chinese flute that he bought online. I feel really grateful to be surrounded by people into art, because what I get from them is a nutrition as important as water to me. You can eat healthy and affordable food that fits your diet anywhere in Ubud. For example, Warung Ijo charges me about 25k Idr ($1.8) for a big vegetarian lunch and a cup of ice tea. Another cool thing about Ubud is, it's quite international. If you miss a specific food from another country, you can find it easily. Japanese, Mexican, Italian, Middle Eastern... This small town got all. If you cook and eat in your home, food will cost you very little, and it'll be healthier than eating outside. We do our grocery shopping from the morning market which opens from 3AM until 8am. This is like a farmer's market in US, except it's affordable. I live outside Ubud in a village called Keliki. A nice little 1 bedroom house costs me $350 per month, including wifi. It has a garden where two cats I adopted ran around every morning, a big bedroom & kitchen, and a half-open bathroom where I shower next to a little garden with frogs inside. Balinese architecture is interesting. As houses are built in the middle of nature, animals eventually will end up in your house. Big and small lizards are always around and I got used to them, there is also rats, snakes and bats. I can't do anything about bats pooping in my bathroom (remember it's half-open), but for snakes and rats, I raised my cats like soldiers. I haven't seen any snakes for a while thanks to my cats' patrol. This is one of the best things about Ubud; you wake up with rooster sounds in the village, and walk into a co-working space where people are building their startups. I built most of Kozmos in Hubud, a nice co-working space made with only bamboo, next to the Monkey Forest. They have a nice garden, monkeys like to visit a few times a week for having quality time outside the tourist zone. In addition to Hubud, there is a few more co-working spaces. One is Outpost, another is Onion Collective. Outpost has a pool, provides stable internet in their a big & modern building where you can easily focus on your work. Onion Collective is a donation-based, also has a pool, but the internet connection is mostly not working properly. 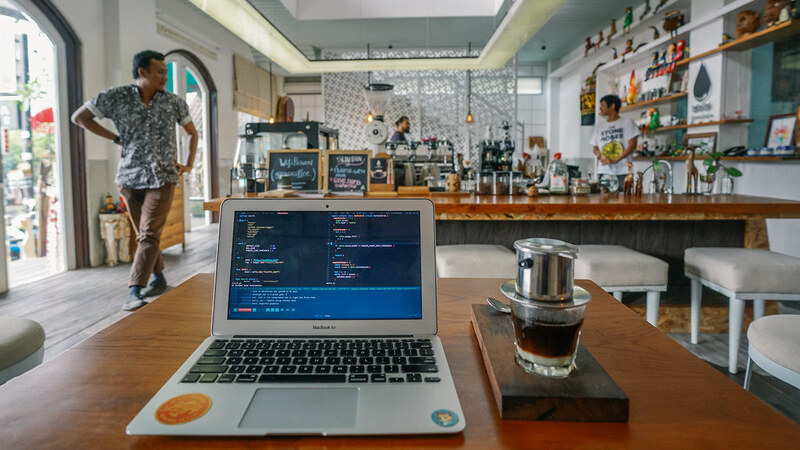 If a coffee shop is good enough for being productive for you, Ubud has so many number of great coffee shops where you can be productive. Personally, I like the ones outside tourist zone, like Gangga Coffee. I like having Vietnamese Drip when I work from Gangga Coffee. Indonesia doesn't require visa for Turkish citizens so my family can visit me anytime they want without going through visa application processes. This is one of the reasons I left US; my family and friends always wanted to visit me when I lived in Oakland but they wouldn't go through the expensive and humiliating visa application process. For people who want to come here and stay longer than 3 months like I do, you can either get Kitas visa, or get 3 months social visa which can be extended but you'll need to re-enter the country. Many foreigners go with this option usually, they basically take a short trip to either Malaysia or Singapore every 3 months and come back to Bali. Waking up in a peaceful environment with beautiful bird sounds heals me both physically and mentally. I sometimes take a walk with my wife to a rice field in the village we live, or go running to a football field. Note that there are hundreds of yoga centers here. I have never done yoga yet but it's everywhere if you'd like to do it. Even co-working spaces offers Yoga class at least once a week. On the other hand, my wife is 8 months pregnant and health is a big deal for both of us now. Thankfully, Ubud is one of the best places to born a baby; the famous birth clinic Bumi Sehat (means Healthy Earth Mother), founded by Robin Lim. It's a non-profit clinic where they offer kind and honest service to everyone, for free (we donate every visit though). Sometimes I miss the city life, biking to work, taking subway, or seeing businessman in suit buying coffee from the same coffee shop I go. Whenever I miss city life and also have a few other reasons to visit a modern city, I go to Singapore. A flight to Singapore costs about $100 and you can get certain things done easier and cheaper there. In my last trip, I had chance to meet an engineer who also wants to build his own startup and we exchanged ideas. I guess I'll try building a network in Singapore, too. Nowhere in the world is perfect, including Bali. Indonesia as a country seems to be one of the worst places to drive a car. Even if you can afford a car, you'd probably prefer a motorbike. The roads are very narrow, there are not much rules, no sidewalks and a lot of chaos. Thankfully, people are patient and respectful in the traffic. I love four season weather. Walking in a street in autumn is a very different experience compared to summer, or having tea in a snowy weather is a different thing compared to having tea in a summer day. I miss 4 seasons weather a lot. Here in this part of the world, there is only two seasons; rain season and summer (tourist) season. And in both, I wear shortpants and flip-flops. Just like any other developing country, Indonesia also has some infastructure issues. Don't have high expectations about internet speed. Things like water floods, electricity cut-off in the entire neighborhood may happen sometimes. There isn't any good solution for tackling thrash problem in whole Indonesia apparently. Especially plastic pollution looks like out of control. The first rule of Bali: construction projects never end in Bali. You see a nice beautiful hill somewhere, someone will build a big villa next year. Things are developing so fast. If you live in Bali, you might be perceived as someone who prioritizes comfort and pleasure over other values in life. And this reduces the chance of getting freelance work as people will be like "this guy wouldn't work hard enough to finish things on time". If you're a freelancer planning to live in Bali, consider this, too. I heard multiple people recommending not to mention Bali in their professional resume's to get a job, even though it's remote. Everyone has a different background and expectations from where they live, hope this blog post gave you some hints. Personally, I like here but would prefer moving to a big city back at some point. We'll be here at least for another year though. My son (who will born in January) will hopefully like here, too. We thought it'd be nice for him to make his first steps in a natural environment.